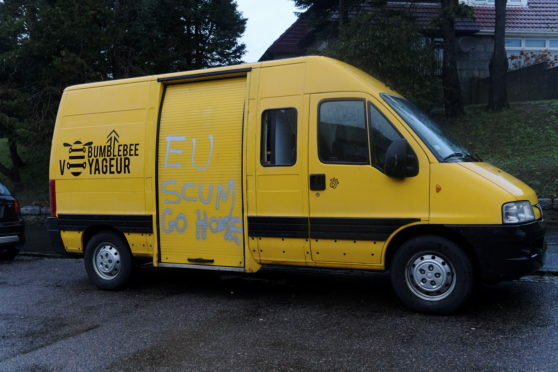 Racist graffiti on a french registered van parked on Polwarth Road, Torry. Officers are carrying out inquiries after a van was vandalised in the Torry area of Aberdeen. Offensive graffiti had been painted across the yellow vehicle parked at Polworth Road. Inquiries are ongoing to trace the owner of the van as well as identifying who is responsible. Sergeant Michael Loughhead said: “Thankfully this incident was reported to the Police by a local councillor who was disgusted by what had been written and we are subsequently reviewing CCTV in the area as well as conducting house-to-house enquiries to identify the person – or people – responsible for this crime. “It beggars belief that such an offensive term would be used in such a public place. Behaviour of this nature won’t be tolerated and I urge anyone with information to get in touch with Police on 101 quoting ref. no. CF0033760219.